Short Sales & Foreclosures have become quite common in the Reno-Tahoe area in the past 5 years, let us help you understand your options and the process involved. Short Sale ... Foreclosure ... HELP!! Do you owe more on your current mortgage or mortgage and second than what your house is worth? Check out the videos and material below for a greater explanation of your options. Video: What is a Short Sale? Video: What is a Foreclosure? 1. Deficiency Judgment - A deficiency judgment is when the lien holder sues you for the amounts still owed on the balance of the lien after the bank foreclosures on the home. For example if you owed $300,000 on the Reno real estate and the bank sold it for $200,000 a foreclosure would leave the door wide open for the bank to sue you for $100,000 deficiency judgment. In a short sale we will get a letter in writing from your lien holders allowing you to sell the home for less then you owe. This will give you protection from a deficiency judgment. 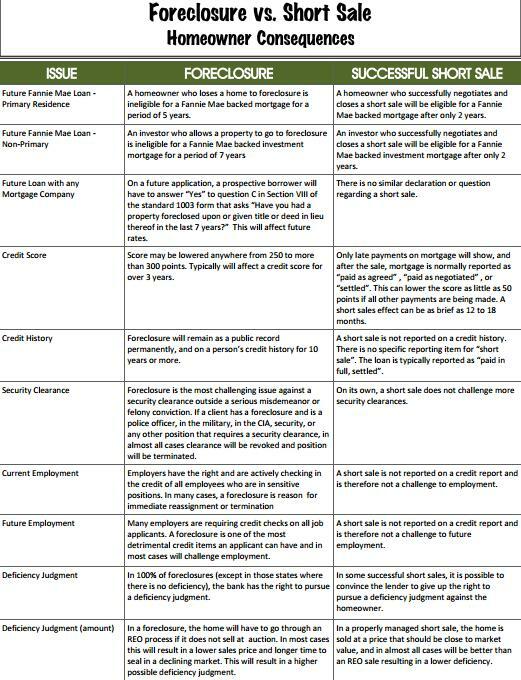 2. Credit Implications - In a foreclosure your credit will be destroyed for 7+ years and the average credit hit is 300 to 400 points. In a Reno short sale your credit only goes down an average of 100 points and in as little as 2 years you will be in a position to buy a new piece of Reno Real Estate. Short sales itself hardly effects your credit; it is the late payments leading up to the sale that will. So In a nut shell with a Reno short sale you could purchase a home again in as little as 2 years. With a Reno foreclosure you will have to wait on average of 7 years, not to mention everything else you will need your credit for over the next 7 years. 3. Lending Implications – With a Reno short sale once your credit has recovered there are no lingering implications. But with a Reno foreclosure or deed in lieu of foreclosure you will have to check the box on the home loan application that asks if you have ever been foreclosed on; on any piece of Reno real estate. This will follow you for life. 4. Tax implications – The tax implications are identical in a Reno short sale or a Reno foreclosure. Currently if the Reno real estate is your primary residence you will not owe a penny to the IRS. You are protected from what is called “phantom tax” by the mortgage debt relief act of 2007. If this is an investment property you still may not have to pay tax on the deficient amount if you can prove to the IRS you were insolvent at the time of transfer. In any case you need to speak with a Reno CPA about your own specific situation. Really there is no downside to a Reno short sale if your other option is a Reno foreclosure. And especially since it is free to you. Your lender actually pays the real estate commission and your Reno real estate closing costs. After three to six months of missed payments, the lender records a public notice with the County Recorder’s Office, indicating the borrower has defaulted on his mortgage. In some states, this is called a Notice of Default (NOD); in others, it’s a lis pendens -- Latin for “suit pending.” Depending on state law, the lender might be required to post the notice on the front door of the property. This official notice is intended to make the borrower aware he is in danger of losing all rights to the property and may be evicted from the premises. If the default is not remedied by the prescribed deadline, the lender or its representative (referred to as the trustee) sets a date for the home to be sold at a foreclosure auction (sometimes referred to as a Trustee Sale). The Notice of Trustee Sale (NTS) is recorded with the County Recorder's Office with notifications delivered to the borrower, posted on the property and printed in the newspaper. Auctions can be held on the steps of the county courthouse, in the trustee’s office, at a convention center across the country, and even at the property in foreclosure. Bank-owned properties are sold in one of two ways. Most often, they are listed with a local real estate agent for sale on the open market. Also, some lenders prefer to sell their bank-owned properties at a liquidation auction, often held in auction houses or at convention centers.